fingerling potatoes, peeled or scrubbed - 2 lbs. Preheat oven to 450F (230C). In medium bowl, toss potatoes, oil, wine, thyme, Horseradish Garlic Potato Seasoning and salt. Spread out in a single layer on a baking sheet and bake until very tender, about 40 minutes. 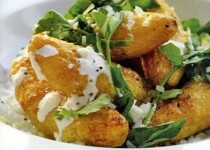 Prepare the dressing: In a large bowl, whisk together oil, sour cream, vinegar, Horseradish Garlic Potato Seasoning. Season to taste with salt and pepper (Can be made and covered in refrigerator 5 days ahead). 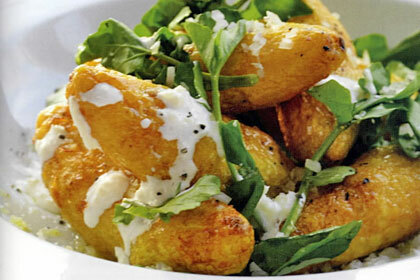 Add warm potatoes to dressing and toss to coat. Divide among 4 plates and top each with a handful of watercress.